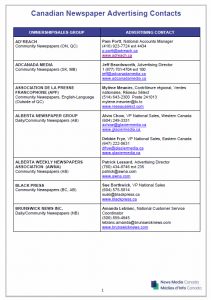 News Media Canada is often asked for sales contacts at newspaper organizations. This handy chart includes contact information for newspaper groups and national sales offices. Each year, we update the list based on our members’ feedback. We have attempted to reflect the current contacts, but if something has changed, please let us know by emailing Kelly Levson at klevson@newsmediacanada.ca and we will update the list.